In my opinion, the single best bargain in a grocery store is the one pound bag of dried beans. The amount of nutrition and protein that can be had from a pound of dried beans is amazing, plus the flavor of the beans far surpasses the flavor of canned beans. I use beans of various kinds in countless different meals, from scrambled eggs in the morning to grilled beans in the evening, from an ingredient in a tortilla to a side dish with steak. Where the value really kicks in is that a one pound bag of dried beans can usually be found for less than a dollar, which yields about six cups of cooked beans without preservatives or the loss of flavor you’ll find in canned beans. Plus, they can be prepared whenever you’re at home for a couple of hours, since they don’t require continuous focus for preparation. Dry beans are much more of a bargain than canned beans. You can buy a sixteen ounce of canned beans for roughly as much as a sixteen ounce bag of dry beans, but the canned beans are already soaked and cooked and also include other liquids for preserving. In essence, you’re getting a lot less beans – beans with the flavor already cooked out, no less – and paying a lot more for what amounts to water. Start the process in an evening when you’re going to be at home the next day. First, put the dried beans in a colander and rinse them under cool water. Move the beans around with your hand so that all of the beans get thoroughly rinsed, eliminating any dust or dirt that might be on them. Then, put the beans in a pot and add water until there’s about two inches of water on top of the beans. I usually measure it with my finger, with water up to the second knuckle and with the tip of my index finger touching the beans. Let that pot sit overnight (unless you’re using lentils, which do not need to soak) or, alternately, let them soak all day while you’re at work. 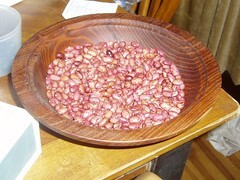 The next morning, drain the beans and toss out the water they soaked in. Add six cups of water, put the pot over high heat, and wait until it’s boiling. Drop the heat down to medium-low so that the water is simmering and use the following guide for how long to let them simmer. Generally, use the size of the bean as a rule of thumb for how long to cook them. This is easier to do once you’ve boiled some “standard” beans and are familiar with the sizes and boiling times. Also, use your own taste buds as a guide. When it gets close to the boiling to be finished, try a bean or two and see if you think they’re too hard. Drain off the water when finished. Storing the beans is easy. After allowing them to cool to room temperature, ust put the beans in a covered container in your refrigerator and they’ll keep for up to four days. This works well if you have recipes you intend to use the beans in in the near future. You can also freeze them, but only for a short period. I usually use quart containers and store them a cup at a time. They keep for about a month – any longer than that and they are very mushy when you thaw them. Sometimes, I just make a batch of beans and leave them in the fridge even without a specific recipe. They’re so inexpensive and so tasty and so flexible that I’ll just add them to anything I’m preparing, from salads to scrambled eggs to tacos – or even just eat a bowl of them for lunch with some salsa and carrot sticks on the side. What can you use them for? I’ve mentioned a few above, but here’s a list of ten ways I like to use cooked beans in my own life. cook up some rice, mix with the beans, add almost any other vegetable (and/or meat) you wish, and you’re good to go. Beans, a bit of olive oil, whatever veggies you have on hand diced up, and a bit of lemon juice and vinegar makes a great cold salad. : beans are a perfect ingredient. cooked beans are a fundamental ingredient in any chili. puree some beans and add other ingredients to your liking, like salsa or garlic (try pureeing the beans with chopped tomato, avocado, green onion, green pepper, cilantro, lime juice, and cayenne pepper for a great dip). toss a few on top of most salads. just add a handful of beans as you’re scrambling them – perfect for breakfast burritos, too. Mix beans and salsa, top with some cheese of your choice, and bake until the cheese is melted for a very easy and tasty side for many meals. you can add beans to almost any soup to directly add protein to the mix. use the ingredients for tacos – including beans – as a pizza topping (with perhaps more cheese than you might otherwise use). There are so many uses for beans, they’re so cheap, and they’re packed with protein, fiber, vitamins, and minerals. A one pound bag of dried beans is simply the best bargain in a grocery store, in my opinion.